Compatible with most Canon EOS DSLR cameras For use with your existing camera. Telephoto lens provides detailed photos from a distance Magnify distant subjects and zoom in for detailed close-up shots. 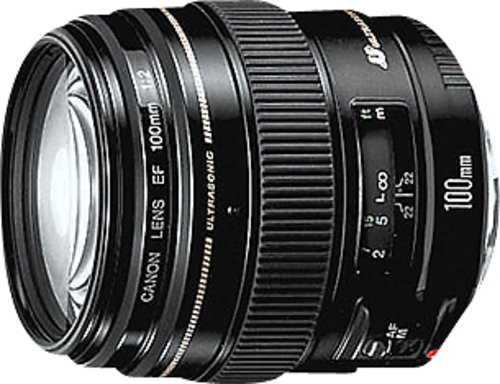 100mm focal length Allows you to capture close-ups and fine details even from a distance. It also reduces shadow interference. f/2 maximum aperture Capture the action at indoor sporting events and other situations with less-than-ideal lighting conditions. It creates an exceptional background blur, which produces stunning images. UltraSonic Motor (USM) autofocus Makes focusing faster easier with a micro-motor built right into the lens ring.